Do you remember the first time you played Super Mario Bros? Growing up, we played endless hours of Super Mario Bros at my friends house. For me though - it was all about Sonic the Hedgehog! Because the Sega Genesis was my first gaming console. But this Holiday season it looks like Nintendo is turning this classic nostalgia into profits. 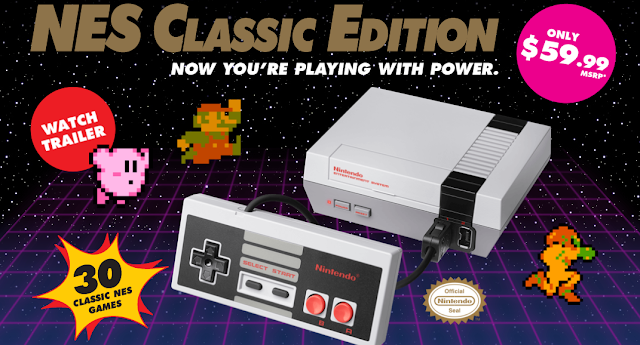 As they've just released the..."NES Classic Edition". A miniature version of the original Nintendo. With 30 of the most popular games pre-loaded. Games like Super Mario Bros 1, 2 & 3, Zelda, Pac-Man, Donkey Kong, Galaga, and all the other favorites. In fact, we went to Wal-Mart to pick one up last weekend. But they were all sold out. When I asked one of the workers about it he said they only got 6 units. Just 6 units for one of the most anticipated Christmas items. Amazon sold out within minutes. In the marketing world this is manufactured "scarcity". Building up the anticipation and excitement by severely limiting the number of copies you release. We all know that scarcity sells. But in this case - I'm not so sure it's been to their benefit. If you go on Amazon, you'll find over 1,000+ negative reviews of the item. Because people are MAD they can't get one. Everyone knows they're artificially limiting the release of the product. Darn you Nintendo! Nintendo actually CREATED a great product for a VERY specific audience. People (like me) in their late 20's and 30's, and 40's remember playing these games as a kid. Nintendo releases a RETRO gaming system with 30 of the very best games for only $59. I'd call that an irresistible offer. And you can make a similar offer to YOUR audience this holiday season. Be it Thanksgiving, Black Friday, or Christmas. Take some of your very best products. Bundle them up for a one-time special price. And do a 48 to 72-hour sale! And you'll create a nice little cash windfall to the make the holidays even jollier.